They look like the kind of gourd that is often decorated to look like a giant pear. Maybe a "bottle gourd"? "Madeiran" isn't in my spellcheck, either, and I think this is the first time I've ever used it. I like the Micronesia story, Gary. As far as I'm concerned it's as good as the official story, which we've heard so, so many times now [yawn], that we could use a new one. 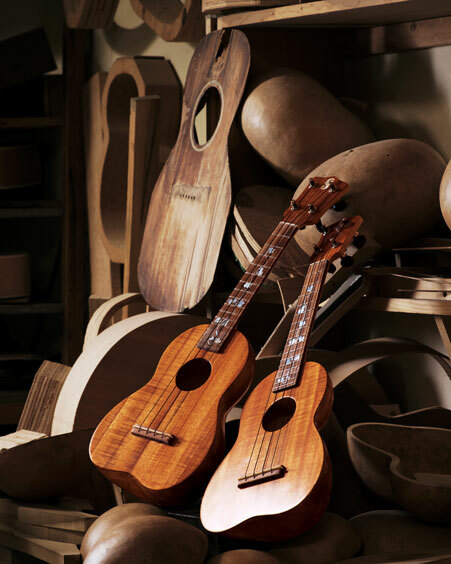 Why not have a Ukulelia contest for a new ukulele creation story? Award one of those nifty Ukulelia tee shirts (made famous in Mighty Uke) for the best one(s). The ukulele is a small instrument, and I can easily picture tiny immigrants from Micro-nesia building them. My husband has a Danny Ferrington Uke. I watched him make it. He does everything by himself. He goes and picks hundreds of gourds at a time He scoops out the gourds himself. He cuts, he stains, everything is done by his hand, alone. the sound is gorgeous! And, Danny is a nice man. He is a master luthier. Great names in music have bought his pieces. He has a book out with all of the stuff he's done. It's called Classic Ferrington Guitars. I hope your opinions change after this. Little Leslie: my jab was directed primarily at Needless Markup and their hack copywriting. I'd love to know more about Danny's gourd ukes. Can your husband post a video or a sound clip? I don't know, I'll ask him.